One of the top priorities of the Marketing & Promo Push is adding buy links to the author’s website and/or blog and sharing links on social media. Posts on Facebook, Google+, Twitter, etc. disappear from view fairly quickly, but website and blog buy links offer a constant source of promotion. Remember to add new books to author profiles on sites like Goodreads, Author Central, Authorgraph, Manic Readers, and RWA’s Novel Engagement as well. Again, those links are always visible. Take advantage of the long-term exposure options! 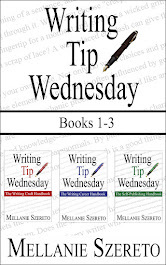 To better prepare for those additions, create a promo info document that includes the book title, series name, word count, release date, ISBNs, taglines and blurbs, an excerpt, and all links. This is a great place for a copy of the current author bio. That promo info document can also include sample tweets and posts. Even a once-a-day routine for several days around release time can be seen as spam if the posts aren’t intermixed with social updates. A continuous barrage of “buy my book” turns off most readers. Find a good balance. Any release parties, giveaway events, blog tours, etc. should be scheduled and ready to begin. Guest posts should be written and submitted to bloggers when requested. Be “present” for promotional events and respond to readers’ comments and questions. That doesn’t necessarily mean spending every minute monitoring blogs and such. Time management is extremely important during this marketing push. Set aside part of the day to continue writing, even if it’s only a couple hours. Balance. Book signings/personal appearances are uncomfortable for many writers, but they offer a chance to interact with fans and gain new readers. Introverts can choose small events at a local library, bookstore, coffee shop, etc. as way to get used to the social aspect of promotion. When authors handle the sales of their own books, they should have plenty of change available. Credit card readers, like Square, can be used as well. While guessing the number of sales ahead of time is nearly impossible, bringing more books than the anticipated need prevents a lost sale. Book signings are also the perfect place to give away swag (business cards, pens, magnets, etc.). Many signings provide only a table (or part of a table for a large event) and chair. Customize the space with a tablecloth and decorations that fit the theme of the book(s). Consider having a receipt book or paper and pencil handy for those wanting a receipt. Advertising is often expensive, but it can provide wider exposure, especially when combined with special pricing. Promoting a price reduction usually boosts sales. However, as mentioned before, free is only effective for improving rankings unless the author has other books available for sale. Book signings are an excellent opportunity to offer special pricing on a single book or bundle-pricing on a series. Creativity is what authors do best! Apply that to marketing and promotion. Check off #13 and #14!